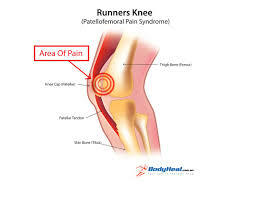 ‘Runner’s Knee’ is the colloquial term for an injury called patellofemoral pain syndrome, and as the name suggests it is a common ailment experienced by runners or sports people. It gets its name from the relevant anatomy that is involved: the cause of pain is the kneecap (patella), which rubs against the groove in the femur (your thigh bone). All four quadriceps muscles join through the patella onto your tibia (lower leg bone). If these muscles are not balanced this can influence the tracking of your knee cap, leading to irritation of its under surface. Other possible causes and contributors may be hip control and strength, foot control and anatomy or your biomechanics. If you experience this, the first thing you should do is stop running, ice your knee and foam roll your quadriceps muscles. This injury can be prevented and treated by a specific individualised program of stretching, foam rolling and strengthening of specific muscles that contribute to this problem. At Southside physiotherapy we can provide you with advice and an individualised rehabilitation and/or prevention program for runners knee. Furthermore, additional therapies such as dry needling, orthotics, manual therapy and taping have been shown to be beneficial for pain relief and return to running. Following your gradual return to sport we can then provide you with a prevention program to prevent this or other sports related injuries in the future.